Vali Siar, M., Gholami, S., Ramezanian, R. (2017). Multi-period and multi-resource operating room scheduling and rescheduling using a rolling horizon approach: a case study. 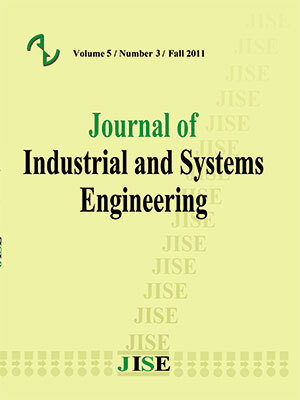 Journal of Industrial and Systems Engineering, 10(special issue on healthcare), 97-115. Mohammad Mahdi Vali Siar; Saiedeh Gholami; Reza Ramezanian. "Multi-period and multi-resource operating room scheduling and rescheduling using a rolling horizon approach: a case study". Journal of Industrial and Systems Engineering, 10, special issue on healthcare, 2017, 97-115. Vali Siar, M., Gholami, S., Ramezanian, R. (2017). 'Multi-period and multi-resource operating room scheduling and rescheduling using a rolling horizon approach: a case study', Journal of Industrial and Systems Engineering, 10(special issue on healthcare), pp. 97-115. Vali Siar, M., Gholami, S., Ramezanian, R. Multi-period and multi-resource operating room scheduling and rescheduling using a rolling horizon approach: a case study. Journal of Industrial and Systems Engineering, 2017; 10(special issue on healthcare): 97-115. In this paper, a multi-period and multi-resource operating room (OR) scheduling and rescheduling problem with elective and semi-elective (semi-urgent) patients is addressed. A scheduling-rescheduling framework based on the so-called rolling horizon approach is proposed to solve the problem. The core of the proposed framework is a novel proposed mixed-integer linear programming (MILP) model with the objectives of minimizing tardiness, idle time and overtime. Pre-operative holding unit beds and recovery beds as important resources in surgery departments are taken into account. At first, a schedule is set for all of the days of the planning period. Then, at each iteration, the scheduled patients are fixed (frozen) for the first day of the planning period and a rescheduling is done due to arrival of the semi-urgent patients. Then the planning period is shifted. This process continues until all days of the planning horizon are covered. Numerical analysis and comparisons are done between the proposed approach and two scenarios which are applied in many hospitals. In the first scenario, the semi-urgent patients would be operated in the first available OR after operating elective patients and in another scenario, a specified amount of capacity is allocated for semi-elective patients. The outcomes conclude that the proposed method has much better performance and also statistical test supports this superiority. Finally, a case study is implemented in a hospital in Iran. Numerical analysis shows that our proposed approach surpasses the actual schedule of hospital significantly. Addis, B., Carello, G., Grosso, A., & Tànfani, E. (2016). Operating room scheduling and rescheduling: a rolling horizon approach. Flexible Services and Manufacturing Journal, 28(1-2), 206-232. Augusto, V., Xie, X., & Perdomo, V. (2010). Operating theatre scheduling with patient recovery in both operating rooms and recovery beds. Computers & Industrial Engineering, 58(2), 231-238. Aringhieri, R., Landa, P., & Tànfani, E. (2015). Assigning surgery cases to operating rooms: A VNS approach for leveling ward beds occupancies. Electronic Notes in Discrete Mathematics, 47, 173-180. Cardoen, B., Demeulemeester, E., & Beliën, J. (2009a). Optimizing a multiple objective surgical case sequencing problem. International Journal of Production Economics, 119(2), 354-366. Cardoen, B., Demeulemeester, E., & Beliën, J. (2009b). Sequencing surgical cases in a day-care environment: an exact branch-and-price approach. Computers & Operations Research, 36(9), 2660-2669. Cardoen, B., Demeulemeester, E., & Beliën, J. (2010). Operating room planning and scheduling: A literature review. European Journal of Operational Research, 201(3), 921-932. Denton, B., Viapiano, J., & Vogl, A. (2007). Optimization of surgery sequencing and scheduling decisions under uncertainty. Health care management science, 10(1), 13-24. Erdem, E., Qu, X., & Shi, J. (2012). Rescheduling of elective patients upon the arrival of emergency patients. Decision Support Systems, 54(1), 551-563. Fei, H., Chu, C., & Meskens, N. (2009). Solving a tactical operating room planning problem by a column-generation-based heuristic procedure with four criteria. Annals of Operations Research, 166(1), 91-108. Fei, H., Meskens, N., & Chu, C. (2010). A planning and scheduling problem for an operating theatre using an open scheduling strategy. Computers & Industrial Engineering, 58(2), 221-230. Ghazalbash, S., Sepehri, M. M., Shadpour, P., & Atighehchian, A. (2012). Operating room scheduling in teaching hospitals. Advances in Operations Research, 2012. Guinet, A., & Chaabane, S. (2003). Operating theatre planning. International Journal of Production Economics, 85(1), 69-81. Heydari, M., & Soudi, A. (2016). Predictive/Reactive Planning and Scheduling of a Surgical Suite with Emergency Patient Arrival. Journal of medical systems, 40(1), 1-9. Jebali, A., Alouane, A. B. H., & Ladet, P. (2006). Operating rooms scheduling. International Journal of Production Economics, 99(1), 52-62. Landa, P., Aringhieri, R., Soriano, P., Tànfani, E., & Testi, A. (2016). A hybrid optimization algorithm for surgeries scheduling. Operations Research for Health Care, 8, 103-114. Latorre-Núñez, G., Lüer-Villagra, A., Marianov, V., Obreque, C., Ramis, F., & Neriz, L. (2016). Scheduling operating rooms with consideration of all resources, post anesthesia beds and emergency surgeries. Computers & Industrial Engineering, 97, 248-257. Lee, S., & Yih, Y. (2014). Reducing patient-flow delays in surgical suites through determining start-times of surgical cases. European Journal of Operational Research, 238(2), 620-629. Li, X., Rafaliya, N., Baki, M. F., & Chaouch, B. A. (2015). Scheduling elective surgeries: the tradeoff among bed capacity, waiting patients and operating room utilization using goal programming. Health care management science, 1-22. Luo, L., Luo, Y., You, Y., Cheng, Y., Shi, Y., & Gong, R. (2016). A MIP Model for Rolling Horizon Surgery Scheduling. Journal of medical systems, 40(5), 1-7. Marcon, E., Kharraja, S., Smolski, N., Luquet, B., & Viale, J. P. (2003). Determining the number of beds in the postanesthesia care unit: a computer simulation flow approach. Anesthesia & Analgesia, 96(5), 1415-1423. Meskens, N., Duvivier, D., & Hanset, A. (2013). Multi-objective operating room scheduling considering desiderata of the surgical team. Decision Support Systems, 55(2), 650-659. Min, D., & Yih, Y. (2010). Scheduling elective surgery under uncertainty and downstream capacity constraints. European Journal of Operational Research, 206(3), 642-652. Perdomo, V., Augusto, V., & Xie, X. (2006, October). Operating theatre scheduling using lagrangian relaxation. In 2006 International Conference on Service Systems and Service Management (Vol. 2, pp. 1234-1239). IEEE. Persson, M., & Persson, J. A. (2009). Health economic modeling to support surgery management at a Swedish hospital. Omega, 37(4), 853-863. Pham, D. N., & Klinkert, A. (2008). Surgical case scheduling as a generalized job shop scheduling problem. European Journal of Operational Research, 185(3), 1011-1025. Stuart, K., & Kozan, E. (2012). Reactive scheduling model for the operating theatre. Flexible Services and Manufacturing Journal, 24(4), 400-421. Van Huele, C., & Vanhoucke, M. (2014). Analysis of the integration of the physician rostering problem and the surgery scheduling problem. Journal of medical systems, 38(6), 1-16.
van Essen, J. T., Hurink, J. L., Hartholt, W., & van den Akker, B. J. (2012). Decision support system for the operating room rescheduling problem. Health care management science, 15(4), 355-372. Van Essen, J. T., Hans, E. W., Hurink, J. L., & Oversberg, A. (2012). Minimizing the waiting time for emergency surgery. Operations Research for Health Care, 1(2), 34-44. Xiang, W., Yin, J., & Lim, G. (2015). A short-term operating room surgery scheduling problem integrating multiple nurses roster constraints. Artificial intelligence in medicine, 63(2), 91-106. Zonderland, M. E., Boucherie, R. J., Litvak, N., & Vleggeert-Lankamp, C. L. (2010). Planning and scheduling of semi-urgent surgeries. Health Care Management Science, 13(3), 256-267.